This has been an odd, frequently confusing and often frustrating NFL season. So many teams that were supposed to be good are just average or worse. Teams that seem good are except for when they aren't. It seems just plain random at times. Through six weeks of games the team with the best record is, to the surprise of many, the Philadelphia Eagles. A lot of people, as I did, likely felt that they were a solid team that was on the fringes of playoff contention. But to say that they would be 5-1 and running away with their division would have required the faith of a rabid fan. It has been pretty impressive. Carson Wentz: Wentz had great success in college, but he was taking a particularly big step up in class entering the NFL last year. He was at times solid, but he often looked like the rookie he was. It was something to build off of, but it seemed like the process could take a few years. Or not, as it turns out. 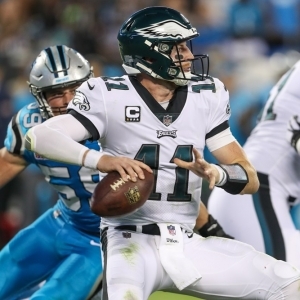 Wentz has 13 touchdowns with just three interceptions, his QB rating is up more than 20 points, and he has been consistently impressive and at times almost heroic. Here, really, is all you need to know - Bovada has Wentz at +250 to be named MVP, which has him as second choice behind only Alex Smith at +150. (As an aide, imagine for a second how crazy people would have thought you were if you said Smith and Wentz would be in an MVP showdown six weeks in). What stands out most when you watch Wentz play is how high his football IQ is. The guy just knows the game so well, and it has clearly allowed the game to slow down for him much more than it often does for a second-year starter - never mind one out of a lower-tier school. Wentz will have a rough game or two ahead, and I wouldn't be in any hurry to bet on those MVP odds, but there are a lot of teams that would kill to have the level of quarterbacking that the Eagles are getting. Defensive inconsistencies: Did you have to read "A Tale of Two Cities" by Charles Dickens in high school? Well, Philadelphia is like a tale of two defenses. Against the pass they are just plain fantastic. Their incredibly stingy 65.7 yards allowed per game is the best in the NFL. To deal with it, though, opposing teams have come up with a perfect formula - they just don't run. The 273.5 passing yards per game that the Eagles have allowed ranks a dismal 29th in the league. We often see a difference between the two aspects of defense, but this level of excellence and incompetence in one package is rare - and seriously concerning. Schedule weakness: While the 5-1 record has been very impressive in this year's league of mediocrity, excitement has to be moderated a little bit once you look at the schedule they have played to date. By far their toughest game was a trip to Kansas City, and that was also their first loss. The rest of the games have ranged from a moderate to winnable test - Washington - to practical gimmes - the Giants and Chargers. They beat Carolina last time out, which was impressive, but the reality is that coming into the season given the expectations they had and how the opponents have played you would have expected no worse than 4-2 here. So, the team gets credit for taking care of business, but they haven't really accomplished a whole lot yet. Now, the good news is that the schedule going forward isn't absolutely brutal, either. If the Eagles keep playing like they have they will be rewarded. Division: When was the last time that the NFC East was this winnable? Washington is fine but far from complete or exciting. Dallas has too much drama and not enough talent. The Giants are just a mess. The Eagles already have two conference wins and a two-game advantage in the standings. Winning the division is very important heading into the playoffs, and at this point it would be far more surprising if Philadelphia didn't win the division than if they did. Betting performance: The Eagles are a strong 4-2 ATS, which makes them the third-most-profitable team in the league behind Buffalo and Kansas City. They have covered their last three spreads and are notably a strong 3-1 ATS on the road. They have also gone "over" the total four times in six games, and they scored at least 30 in the two games they went "under" so they have consistently done their job for totals bettors.